This is too important not to act! 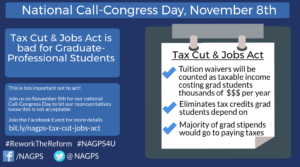 This Call Congress day serves as an opportunity for graduate and professional students, and higher education advocates to let our representatives know that provisions in the Tax Cut and Jobs Act will ultimately hurt students and is unacceptable. Tuition waivers will be counted as taxable income and would ultimately cost graduate-professional students thousands to tens of thousands of dollars per year. Elimination of tax credits that graduate-professional students depend on, such as the American Opportunity Tax Credit, the Lifetime Leaning Tax Credit, and the Student Loan Interest Deduction.